From behind the book stacks she watched the intruder slink into the aisle. Well, of course he wasn’t an intruder. Hopefully he was a paying customer. She’d had too few of them during this brutal meandering month of March. But that was part of the program. During the quiet season here on Block Island, Charlotte got used to her own company; she got used to brewing herself a carafe of hot tea and savoring the smell of jasmine and lavender. She got used to the quiet. But now this boisterous man had unsettled her silence. Not that he’d made much noise, but his shoes did squeak on her worn hardwood floors, and he did clear his throat a number of times. “Can I help you?” Charlotte inquired with a slight rise to her voice as the poor man nearly jumped out of his skin. At her voice, the diffident man walked closer to Charlotte, who happened to be standing underneath the store’s antique crystal chandelier. She noticed the man peer at her over his bifocals. Charlotte stepped out of the light. “Charlotte?” the man asked like a child asks for a second piece of candy. Charlotte touched her hands to her face, as if checking for sure that yes, indeed, she was Charlotte. She glanced cautiously at the mirror hung on the back wall of the shop, where in wavering layers it told of a 50-something woman wearing flannel-lined jeans and a plaid pink shirt facing a stranger with a mixture of surprise and hope, suspicion and hunger. His gasp told her everything she needed to know. Flash fiction using the words bookstore, intruder, crystal chandelier, and bifocals. ← Marching Along . . . Some days are easier than others! I too love it. These are the stories I savour. Will you write more of this talk? It should say tale. Sorry. Very nice Pam. It must be a heart-stopper, being suddenly confronted by someone from one’s forgotten past. Especially in such a peaceful setting. What was fun in this story, Roy, is that when I began it, I had no idea where it would go. I just knew I needed to get in the words “bookstore, intruder, crystal chandelier, and bifocals.” Perhaps I should ask readers what words I should include in the sequel. Do you have a word to offer…? Your skills will rise to the challenge Pam. Pam you’ve done it yet again … led me up the garden path and tingling at the end. Gardens can be like that. 🙂 I love the idea of a garden of words. Thanks so much. So glad you enjoyed my bookstore story, Henrietta. Thanks so much for reblogging it! I like your story and it is a great cliff hanger to allow the reader to create their own ending! If I were to meet a special someone (since who knows about my 10 month guy. . .) I would love it to be on a street corner, in such a bookstore or the cliched class reunion. You and I are romantics, Robin. ❤ After all, "relationships DO reveal our hearts"! I began this story in a bookstore because my task was to include the words bookstore, crystal chandelier, bifocals, and intruder. If I continue this story, I'm asking readers for four other words to use. Would you like to offer a word?? Hey more please, Pam . Who is Andrew? Great story – really enjoyed it. Perfect ending. Okay, I’m offering up a chance for my readers to help me write the next sequence to this story. In the first one, I had no idea where it was going, just knowing I had to include the words: bookstore, crystal chandelier, intruder, and bifocals. Would you like to offer a word that I should include in the sequel? And go on? This would make a great novel or a continued series. I am thrilled with so many requests like yours to keep the story going. In the first one, I had no idea where it was going, just knowing I had to include the words: bookstore, crystal chandelier, intruder, and bifocals. Would you like to offer a word that I should include in the sequel? Pam I don’t’ think I can add a word that would measure up to your genius. I have a feeling they may be reluctant lovers, Merril. Shall I continue to write and find out? In the first one, I had no idea where it was going, just knowing I had to include the words: bookstore, crystal chandelier, intruder, and bifocals. Would you like to offer a word that I should include in the sequel? Hmmmm. . . how about magnet? PAM, please continue the story. You’ve pulled my arm hard enough – I say OKAY!! In this story, I had no idea where it was going, just knowing I had to include the words: bookstore, crystal chandelier, intruder, and bifocals. Would you like to offer a word that I should include in the sequel? How could you not enjoy a story featuring a bookstore. Well done, Pam! Pam, I sense the same zippy dialogue and element of surprise here as in your novel I’m reading, The Right Wrong Man. I like all the comments, especially this one: “you led me up the garden path and tingling at the end.” That nailed it! Lovely story, but please don’t leave us hanging. More, please! Okay, okay, you’ve convinced me to go on with Charlotte and Andrew. In this story here, I had no idea where it was going, just knowing I had to include the words: bookstore, crystal chandelier, intruder, and bifocals. Would you like to offer a word that I should include in the sequel? You’re on …. moonlight will be one of my words! Oh, a book store! What a beautiful story. It touched my heart! I also like flash fiction because it makes you condense an idea — and I see a longer story that could be written. You’re so right, Patricia. As a reader, I prefer novels to short stories, because in a short story, I just get to know (and partially understand) a character, and too quickly, the story ends. I like savoring my time with the people in a book as they slowly unravel whatever drama/triangles/struggles they’re involved in. But I’ve learned as a writer that sometimes the open questions in a piece of flash fiction are fun for a reader, as she/he tries to fill in the blanks. That said, many readers here are asking me to go on with this story. When I wrote this one, I had no idea where it was going, just knowing I had to include the words: bookstore, crystal chandelier, intruder, and bifocals. Would you like to offer a word that I should include in the sequel? Almost anyone can write (or film) about things blowing up. It takes a real writer to build a story and true interest on shoes squeaking across hardwood. Be still my heart. Yes, Erik. a small interaction in a tiny remote bookstore is SO much more interesting than a big explosion that blows up but doesn’t delve into the nitty gritty of life. In this story, I had no idea where it was going, just knowing I had to include the words: bookstore, crystal chandelier, intruder, and bifocals. Many readers here have asked me to continue with Charlotte and Andrew — would you like to offer a word that I should include in the sequel? When are you going to post chapter 2? Did I ever tell you how great I think you are? 🙂 Okay, Anneli, you’re part of this quest to find out what happens next now. In the story I posted here, I had no idea where it was going, just knowing I had to include the words: bookstore, crystal chandelier, intruder, and bifocals. Would you like to offer a word that I should include in the sequel? Oh. Such wonderful writing. I love the way she touches her face to make sure she’s herself – it creates such a great sense of disorientation and magic. I want to know what happens! Some of my best short stories were ones where I had a list of word prompts. I’ve been thinking of filling a jar with random words and picking. I’d love to pick a word – canoe. Hee hee. Nice story! I would love to be in such a bookstore! Why I love the story is because it is open-ended and could stir many memories! Thank you so much for enjoying my book store story 📚! 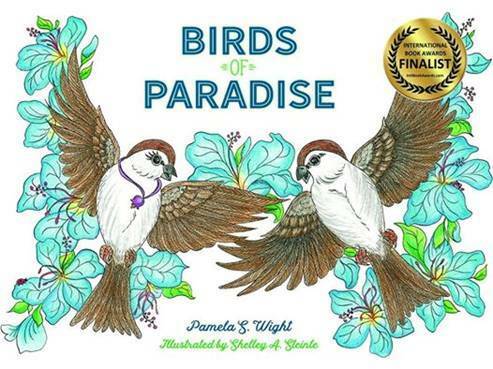 A lovely story Pam, suspense with a sweet end. You actually had me at the title….but like so many other readers, “surprise and hope, suspicion and hunger” totally did it for me! Oh! What’s next? Keep going! Intriguing for sure, Pam! What happens next? Hubs and I love the used book stores too! It was such a treat to see my story reblogged on your site When Angels Fly. Thank you so much! Pam, what a lyrical, lovely story! I love the surprise ending. The ending was a surprise for me too, Lynn. Thanks so much for sharing it on Twitter! How fun to meet a “lost love” or “old acquaintance” when you least expect it! What a good story! At the beginning, I had no idea where it was going to go, which made it even better. Plus, I love any story set in a bookstore! Please, please, continue this story, I love it! You certainly do grab the reader’s attention and make him or her want to know more. Nice job. I look forward to reading more. Reblogged this on Anneli's Place . I really liked it, especially that gasp! What a great story! I totally enjoyed reading! Thanks so much for sharing. You made my day! Loved this story.. Have you read “The Storied Life of AJ Fikry” by Gabrielle Zevin? It is a sweet story of a man who owned a bookstore and his daughter… I just loved it.